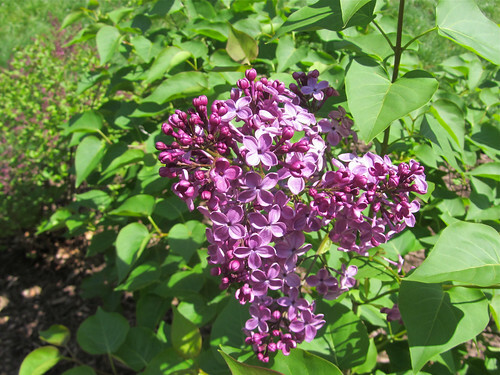 A few years ago Mickey and the kids got me three lilac bushes for Mother's Day. We moved them to the new house. One of the dwarf ones is mostly dead but since there is some green on it I thought I'd let it go to see if it would do something. There's more green on it this year than last so there may be some hope for it. On the big lilac bush there is only one bloom. The others have died due to frost. (I really don't like frost but I forget to cover my plants at night.) I thought the bloom was too pretty not to photograph. Wish I could share the fragrance with you. Guess you'll have to use your imagination. The other dwarf bush seems to be loaded. Can't wait for those blooms to open. I'll be sure to photograph it when it does.